Alphane Villa is not only ideal for adventurous honeymooners, but its perfect for couples looking to get away from the hustle and bustle of city life. 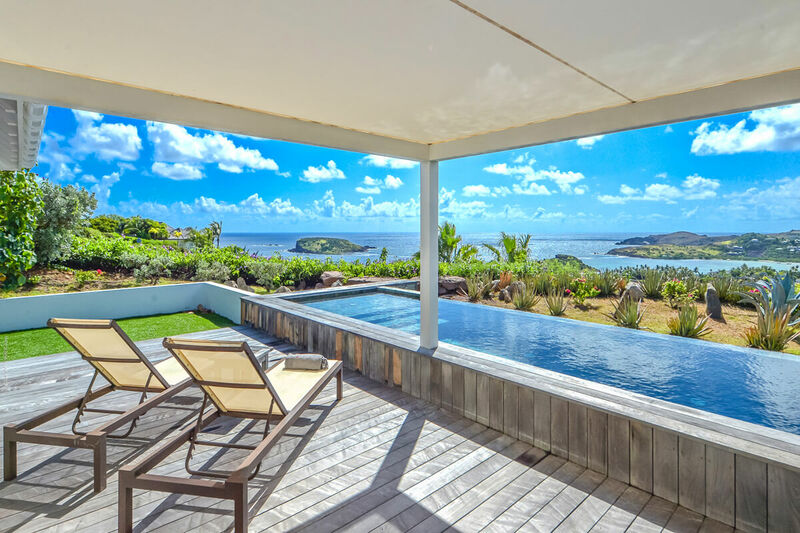 Enjoy peace and quiet while sunbathing by the pool or sipping on a cocktail while watching the island birds fly overhead. Look out onto the water and take in the aromas of the sea. Alphane Villa is located on an estate in Mont Jean. This one-bedroom villa is perfectly equipped with every comfort of home. This rental has a private lap pool with a wading area elevated above the ground. A partially covered terrace runs along the edge of the pool and faces the sea. The deck holds loungers, a dining nook, and an outdoor living area. There’s also a small lawn with a BBQ grill, and lush gardens border the entire yard. The villa has private parking and is in a gated community. Alphane enjoys extensive ocean views and cooling Caribbean breezes. This villa is fully air-conditioned and has an open design. Guests can watch movies on the flatscreen Apple TV while cooking on stainless steel appliances in the kitchen. The breakfast bar has seating for two guests, and the kitchen has an range hood, coffeemaker, blender, and toaster. The spacious bedroom has large bay windows that bring in the ample sunlight. Two walls open to the deck, and a desk lays against the third wall. The bedroom also features a modern ensuite bathroom with a large walk-in shower. Alphane enjoys housekeeping six days a week, and can be rented with Aquamarine Villa for an additional four bedrooms. Marigot Beach is nearby, and Grand Cul de Sac is a minute further. pool size 8.2 ft. x 27.0 ft.